Connect with Snap AV to get extended trial, pre-populated catalog, and unit costs. D-Tools Cloud has partnered with SnapAV to provide dealers the best experience for building quotes and winning proposals. Here are the key benefits you will receive by connecting to your SnapAV account (or signing up). From both the D-Tools and SnapAV website, you can signup for a trial with D-Tools Cloud. From DTCloud, you can connect to you SnapAV account. You can also go to d-tools.cloud to signup. There are multiple places to connect to your SnapAV account, so don't worry if you forget to do it in certain places. 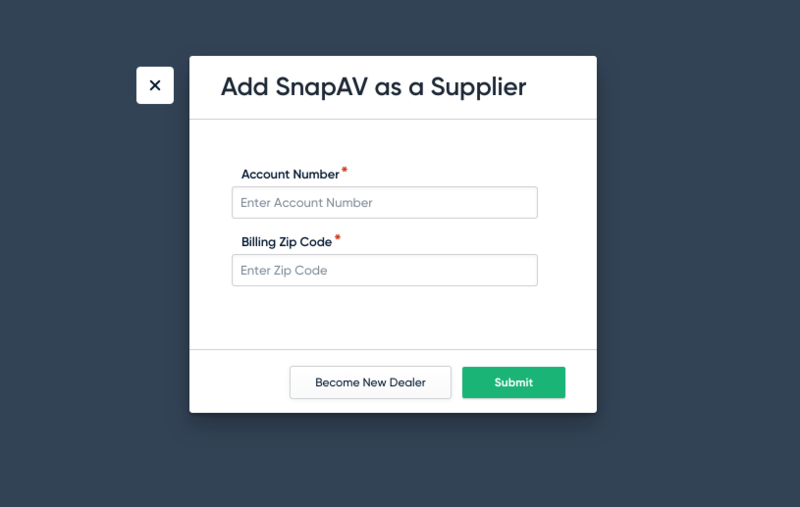 Catalog - you will see a SnapAV banner or find a SnapAV brand to connect to your pricing tier to add unit costs. has authorized you as a dealer. If the S-Code and Zip code match up, you will be connected to SnapAV and receive the benefits from above. This should happen instantaneously. If we don't find a match, we reach out to SnapAV to ask them if you should be approved. They may choose to approve or decline you as a dealer. If you are declined, you will receive a comment from SnapAV why you did not get approved. Any further communication should be done directly with SnapAV. If you are not an existing SnapAV dealer, just click the link to become one. You will be redirected to SnapAV's signup page. Once approved, you will get an Account Number (S-Code) from SnapAV. Take that with you Billing Zip Code and come back to this step to enter it. You will then get approved and have SnapAV added.